Busily retired, Janet Sheridan writes in a comfortable home she shares with a husband she enjoys in Craig, Colorado. Janet Sheridan’s wry, often tender, observations on life draw the reader into the poignancy and fun of a long life spent in the rural west. In this delightful compilation, you’ll meet a variety of mostly good people, each with their own quirks: six siblings who matured in unpredictable patterns, Aunt Beulah of girth and grace, a ninth-grade student filled with forgiveness, and the author’s husband, who leaves tools and clothes in full view-so he won’t forget he has them-but hides his potato chips. 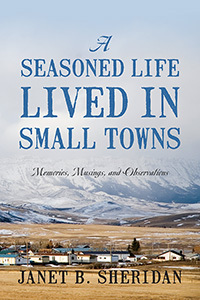 A Seasoned Life Lived in Small Towns is a collection of unpublished material and human-interest columns written for the Denver Post and the Craig Daily Press-all drawn from the 70 years Janet Sheridan lived as a child in Utah, an adult in Nevada, and a woman facing the reality of her advancing years in Colorado. 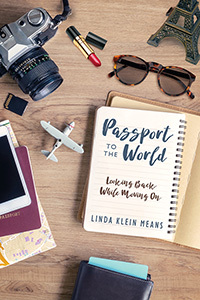 Her work was awarded first place in Category IV humorous column writing in the Colorado Press Association’s 2010 competition and first place in both humorous and serious column writing in 2011. “Janet Sheridan is a treasure. She’s a skilled craftsman whose sharp intellect, creativity, and precise writing-not one word is wasted-leaves a reader wanting more. Her oh-so-lovely, mellifluous prose should be savored, like this paragraph from a 2010 Colorado Voices column: My musings about children of the world and fairness ended with the shocking sight of Ruthie Miller eating toothpaste. I corrected her in a fierce whisper, smoothed my plaid dress over my knees, and wondered if the cafeteria ladies had baked cinnamon rolls for lunch…” -Barbara Ellis, Editorial Page news editor and coordinator of the Colorado Voices program, The Denver Post. “Janet has a unique voice that meshes folksy narrative with creative storytelling. An educator by trade, her readers are fortunate she found her true calling later in life. I’m proud to be one of her biggest fans. She’s a true artist in this writing craft of ours.” -Josh Roberts, Former Editor, Craig Daily Press. James Hudson is Professor Emeritus at the University of British Columbia, Vancouver, where over the last 45 years he has carried out teaching and laboratory research on many human, animal and bacterial viruses, and the use of safe natural products to keep them under control when necessary. This has included several collaborative projects with institutes in developing countries. He has published more than 150 papers in peer – reviewed scientific journals. Since his semi-retirement from academic life, he has lived in peaceful Tsawwassen, British Columbia, with his first and only wife, Louise. We live in an age of paranoia, bombarded daily by the media about the dangers of infectious microbes and viruses that threaten our very existence. The pharmaceutical and biotech industries insist that we are in a continuous state of war with our microbes and we have to protect ourselves with their elaborate weapons of microbial destruction. But do we really need them? Each of our bodies is teeming with trillions of microbes and viruses. Many of them are normal lifetime residents that do us no harm. In fact, some of them are essential to our health. Microbes and viruses were on the planet long before humans appeared, and we must learn to live in harmony with them. Professor Hudson takes us on a fascinating journey into the world of microbes and viruses, and puts things into perspective in a nontechnical, lighthearted exploration of this amazing microcosm within us all.